Spey lines are fascinating creations if you know anything about the history of fly line design. The first Spey lines, meant for use with a two-handed rod, were braided silk and were woven on complex helical braiding machines in the 19th century. Those lines were assembled a lot like backing/core braid, or like a Chinese handcuff. Back in the 1890s, men like Alexander Grant were able to set world records for distance casting (195 feet!) using enormous 20-foot long greenheart Spey rods and simple, braided silk line. The taper of preference back then was the double taper, which was pretty easy to make as you simply started removing material from the braid as you approached each end, to make a natural taper. The weight forward fly line revolution developed in the 1930s as a response to an increased use of tech in fly fishing. Weight forward lines really got juiced in the 1950s and 60s with the development of PVC fly lines that floated. It wasn’t until the 1980s that Spey fishermen began seriously tinkering with fly line, but by the late 90s, two-handed lines were being developed in all manner of crazy configurations. Anglers in the Pacific Northwest invented Skagit lines, which were chopped up conglomerations designed to bomb heavy tips big distances. Scandinavian anglers were evolving their two-handed lines in the same direction, creating extreme weight-forward profiles with very long, thin front tapers, thus giving the Spey angler a lot of weight right at the front of the D-loop formed up by the roll cast which is the basis of every Spey cast. The long front taper allowed the line to remain connected to the water. 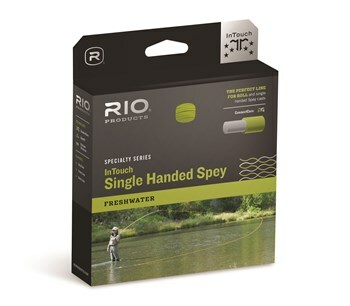 You need that history lesson to understand what Rio has achieved with the InTouch Single Hand Spey ($99) series. Note the heavy Body 1 and Body 2 tapers in the line profile above. That massive bulk gives the single-hand Spey caster an enormous amount of weight to work with, easily setting up sixty to eighty foot roll casts with a normal, one handed five weight rod. The line is not so bulky, however, as to prevent aerialized casting. The handling section at the back of the head helps ease the transition to the running line, eliminating most of the hinging effect which is the cause of loss of control with almost any shooting head-type line. All in all, this line has all the best aspects of Skagit line (extreme weight for the class being most notable), plus the more delicate touch of Scandi lines (offered by that long front taper). If you spend much of your time nymphing or swinging streamers from a stationary position, which is a tailwater fisherman’s bread and butter, this line will make your day easier. I could see this being highly useful for white bass fishermen or anyone who needs to consistently target wadded up fish. I’m planning to take this with me to Iceland in a few weeks to target arctic char, which hold together, close to the bottom in long runs. 2 Responses to "Rio Products InTouch Single-Hand Spey Line"
Spey lines are one of the best crafted lines for fly fishing. With a design that has lasted for so many years, I find myself traveling all over the country just to enjoy using it! Looking at my google timeline, I have been fly fishing in more locations than I can count, and I have yet to change my mind on the quality of my Spey line. With all of the traveling I do to fish, I’m glad to be able to stand in one place and cast my line with such ease. I’ve loved using this line for atlantic salmon. It casts incredibly well and is super versatile. I’ve fished it with graphite rods and bamboo (preference for the latter of course!) and it’s been fantastic. I’ve started buying this line for friends and fishing buddies as gifts.